A car perfectly balanced between performance and comfort is the holy grail for the enthusiast, and once you throw in a financial constriction then getting that balance becomes very hard to achieve. With the tenth generation of Civic, Honda has pulled out all the stops to try and get the recipe right and keep it simple. Whether you choose the sedan or coupe, you’re getting a 205-horsepower turbocharged engine, a 6-speed manual transmission, and a black cloth interior featuring the Si’s bolstered sport seats. You're only real choice is between having it with two doors or four. The choice between sedan or coupe is an interesting one. The weight saving with the coupe is negligible, but the lower roof at the back will help keep the center of gravity down at the cost of rear-passenger headroom. Our test car is the sedan and, when driving it, we didn’t find ourselves thinking it needed a sloping roof so mostly that decision for buyers will come down to choosing between style or practicality. For 2019 there’s a minor refresh for the Si that includes bringing back physical buttons, including one for the climate control’s fan speed, and the return of the volume knob. Also, the steering wheel controls have been simplified, the cupholders have gotten bigger, and the parking brake switch has been updated. A summer tire package is no longer a factory option but you can order extra grip from the dealer. Looks are a point of contention with this generation of Civic and it really boils down to a matter of taste if you like the aggressive angles and the general busyness of the overall design. For the Si specifically, much comment has been passed on the big fake vents on the front and rear corners. 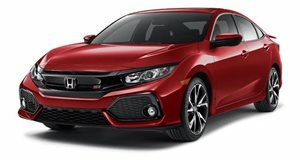 The Si doesn’t punch up the styling as much as the Type R though, and the only other giveaways to the casual observer of this being a performance Civic are the rear spoiler, which is a little higher now, the center tailpipe shape, the discrete Si badges, and the chrome trim is replaced with black to give it more of a scowl from the front. For the refresh, you can now get the coupe in the startlingly vivid Tonic Yellow Pearl color and the sedan in the more restrained Platinum White Pearl paint at no extra cost. Our tester came in Aegean Blue and it’s, for good reason, a popular color on the current Civic. The 1.5-liter turbocharged powerplant is the same found through the Civic range but with a nice little bump to 205 horsepower and 192 lb-ft of torque. Although we miss V-TEC and the opportunity to make cliche’d jokes about it, you don’t have to rev the new engine hard to get to the torque anymore. Instead, the power comes on tap between 2,100-5,000 rpm and the engine redlines at just 6,500 rpm. While that drastically alters the personality of how we’ve come to know the Si, that power being available earlier makes the car feel very punchy indeed. Between the flat torque curve and the Civic’s low weight, there’s less math and gear shifting to do when it comes to overtaking. The Civic Si is rated at 28 miles per gallon in the city, 38 on the highway, and 32 mpg combined. We got just 26 mpg combined, but we doubt anyone driving the Si for the first week will get much better as it’s just too much fun to keep the right foot restrained in the name of economy. After the first month of fun though, we could see people getting around 30 mpg without thinking too hard about it on the way to work. The only downside is that it runs on premium gas, but with fuel economy like that, it's not too hard to swallow the offset. The Si is built on the Civic’s Touring trim, so it comes with the 7-inch infotainment display that covers the basics well and includes Apple Carplay and Android Auto. There’s plenty of room for passengers because the Civic has grown to the side of an Accord a couple of generations ago and, in general, the Civic interior is well thought out and comfortable. We’ll gloss over the fake carbon-fiber pattern plastic across the dashboard and get to the fun things that the Si trim brings to the party. That starts with the well-bolstered sports seats, which do a great job of hugging the sides of your body to keep you in place. Honda has done a solid job of making them look stylish too. Red stitching can be found throughout, including the leather-wrapped steering wheel and the leather on the gear knob and its boot. Overall, the blend of practical and the air of sportiness is effective. The only issue we found is that the gear knob is bare aluminum at the top and looks great, but there’s a trade-off in how hot it gets against your palm in hot weather. We noticed how uncomfortable that can get and we haven't reached summer here in California. The Si trim also brings red lighting to the gauge cluster, which has a selection of different interface displays including real-time feedback on turbo and braking pressure as well as a graphic to show the g-forces being exerted. There’s also a couple of red bars over the center display that light up when you start to run out of revs and need to change gear, and you can have a display telling you when to actually change gear. Then, when you change gear, you’ll be using the sporty looking aluminum pedals which we would recommend trying first if you like to rev-match on your downshifts as the accelerator is set quite deep. What the Si trim leaves out is the Honda Sensing package that’s become standard almost everywhere else. The thinking is good there as the Si is squarely aimed at people that care about driving and are less likely to need the equipment, and that also keeps the cost off of the invoice sheet. While the Type R is the Si’s ballistically enhanced track based brother, the Si isn’t the halfway mark from standard Civic to lunatic Civic. The Si is absolutely its own thing, with its own character and, despite not getting a massive power bump, it’s engaging and enthralling to drive hard and relaxed but fun to drive soft. A lot of that is down to the suspension which is more than good enough to throw around in Comfort mode if you forget to change when things get enthusiastic. Put it into Sports mode though, and the suspension stiffens while the steering gets heavier and the throttle response sharpens. If you then forget to go back to comfort mode, the suspension is so good it might be a while before you realize. While the short-throw gearstick doesn’t quite reach the cliched snick of a rifle bolt, it is definitely one of the better manuals around. Add all of that together with the Si’s front limited slip differential (LSD) and satisfying stick shift, then back roads become a hunting ground for corners. The handling is excellent, but the level of grip is grin-inducing. Some of that has to do with the summer tires, but as much is to do with the Civic's already responsive chassis, the new suspension setup, and the LSD all working together. Because the LSD stops the inside front tire from spinning uselessly, that grip is turned into pull. The ability of the Si to tenaciously hold on all the way through a corner and get the power down early puts things on a whole different level to the Civic Sport. While the purists that have driven older naturally aspirated Si models might miss the character of the higher revving V-TEC engines of old, finding the torque in the lower range of turbo engines revs does a lot to help keep things entertaining. Despite only having 205 horses to put down, we didn’t find ourselves wishing there was more power. Honda has made this easy. You can choose the coupe or the four-door sedan and you pay the same price. There is just the single powertrain and no factory options other than the Honda Factory Performance Package for $3,999 that includes front and side underbody spoilers, 19-inch black HPF alloy wheels on summer tires, as well as HPF badges for the body. All of which we think are unnecessary. For $24,300, the Civic is at a great price point for what you get and inflating that cost defeats the object. Unless you get the HFP package, summer tires are now a dealer-installed accessory. We’ve spoken to owners that split between using the summer tires and all seasons, and the general verdict is that sitting on the limit at lower speeds is still huge fun and the ride is better around town. The Civic Si is a complete package, and deftly manages to combine a car you can enjoy driving like your hair is on fire or piloting around calmly like a normal human being. The breadth of driver enjoyment added to the practicality and space of the Civic and an excellent price-point for the amount of car on offer means we can confidently file the Si as a Must Buy.